Music in Horror Film is a collection of essays that examine the effects of music and its ability to provoke or intensify fear in this particular genre of film. Frightening images and ideas can be made even more intense when accompanied with frightening musical sounds, and music in horror film frequently makes its audience feel threatened and uncomfortable through its sudden stinger chords and other shock effects. 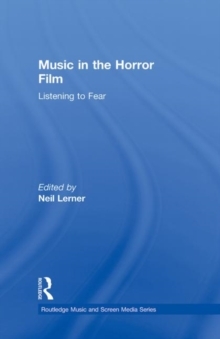 The essays in this collection address the presence of music in horror films and their potency within them. With contributions from scholars across the disciplines of music and film studies, these essays delve into blockbusters like The Exorcist, The Shining, and The Sixth Sense together with lesser known but still important films like Carnival of Souls and The Last House on the Left. By leading us with the ear to hear these films in new ways, these essays allow us to see horror films with fresh eyes.